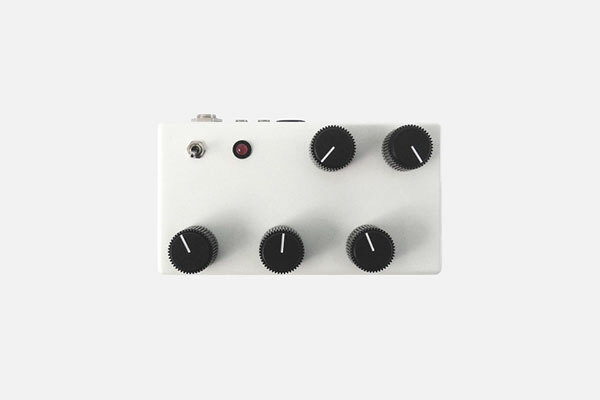 This device is based on a stepped-tone generator but with a sweeping LFO giving it an almost automated looping effect, as well as a low-pass filter that allows you to sweep the high-end in or out. It is capable of many varied sounds and this description does not do it justice. Along the bottom you have controls for LFO speed, frequency, and pulse length. At the top is the low-pass filter and volume. The case is extremely tough die-cast aluminum, painted glossy white. With a 1/4″ output jack it is easy to connect to amps, effects or recording equipment. It is powered by an included 9volt battery or any DC adapter 9 Volts (center negative). There are also 1/8″ sync out and sync/CV in jacks, this will allow it to communicate with any equipment that makes use of 5volt clock. This was designed and hand-built in Oakland, California.